Index The future is performance per Watt. Test Configuration Database Benchmark Results Power Consumption Results How does power consumption affect the bottom line? More processing power has long been the focus of the processor giants, but times are changing. Performance per Watt is the focus for both AMD & Intel for the foreseeable future. In October of this year, Intel invited AnandTech to its Jones Farm Campus in Portland Oregon. The purpose of the visit was to get a detailed overview of their roadmap for the next year, and to take a close look at the Bensley platform. Bensley is the code name for Intel's new Xeon platform, which will support both Dempsey and Woodcrest processors and a new chipset, code-named Blackford. Demspey is going to take us well into Q2 of next year, and Woodcrest will appear sometime in the second half of next year. Woodcrest will be a lower wattage part that is focused on performance per Watt. Dempsey is the processor that we're going to take a look at in this article. 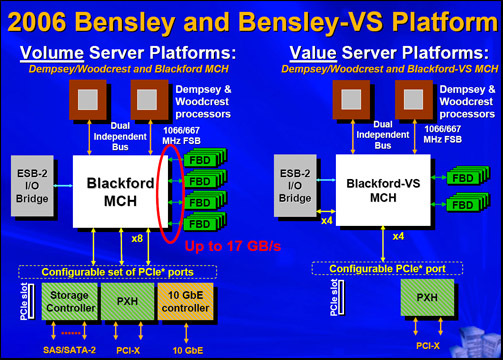 What we'll be showing benchmarks on is a pre-production Bensley platform. Performance may differ once the platform reaches production status. The key features of Dempsey are: dual-core support, 65nm fabrication and an Independent L2 2MB Cache (2x2MB). Intel will release three variations of the Dempsey processor: a 1066 MHz FSB (130W) version that is the "Performance" version, a 1066 MHz FSB (95W) version that is a rack-optimized part (perf/power for rack density) and a 667 MHz FSB (95W) value version. The Blackford chipset is all new for Xeon, and addresses one of the main bottlenecks that we've seen in previous Xeon chipsets, front side-bus. Blackford uses a dual independent bus architecture operating at 1066MHz. Memory is now FBD-DDR2 (Fully Buffered DIMM) running at 533MHz, which offers up to 17GB/s of memory bandwidth. The future is performance per Watt. Index The future is performance per Watt. Test Configuration Database Benchmark Results Power Consumption Results How does power consumption affect the bottom line? I'm curious that the numbers dont reflect the true difference between equivalently configured Intel vs. Opteron systems. The Dempsey processor TDP max is 130W and the Opteron is 95W. That difference is only 35W. The memory controller needed by Dempsey should only consume 60 - 80W. Using 80W that gives the maximum total difference between two eqivalently configured systems as 80 + 35 = 115W. Yet in the max processor utilization tests the difference was 214 Watts. So where is the extra 99 Watts being used? FBD? If so then when Opteron uses similar memory technology the delta will not be as great. to keep anthing at a constant temperature, the heat going into the system must equal the heat being taken away. so if one system uses 200W of power, first you have the cost of the 200W, then you have the cost to remove the 200W of heat given off by the use of the system. on top of this air, conditioners are 20-25% efficient at best (if i remember correctly), so the amount of power used to remove the heat generated would take 3-4X more energy to remove. so in essence you are looking at at LEAST 2X amount of money calculated in the article. (i took a year of thermodynamics at school here, when i was an undergrad) in reality, you are probably looking at 4-6X to run and remove the heat from the data center. they should have looked at the opteron 2.2ghz HE (low voltage) i'd be interested to see what power numbers those put up. Opteron 270 HE is the highest of the lower wattage 2 Way Opterons and it runs at 2.0GHZ. That will teach me for just taking a $1,000 measurement devices reported figures :) It actually figures out the cost, which obviously was wrong. I've updated the numbers, they should be correct. With over a 1Ghz defecit (yes I know) in processor speed, and with only 1MB of cache per core rather than 2MB, I think we can safely say that Intel is still clutching at straws at this level of the game.